Sitting on 800 acres in the foothills of Costa Rica’s Talamanca mountain range, Kinkara emerges like a vision from a dream, a tiny ring of white tents on an impossibly green and lush plateau 3,000 feet above sea level. The journey to this idyllic, remote setting, which is ringed by an expansive backdrop of mountain peaks, is made by prop planes that carry no more than seven passengers. After a 30-minute flight from San Jose International Airport, we come to a landing just outside Kinkara’s main lodge, gliding to a stop alongside a line of smiling staff members who stand politely waiting to greet us, making me feel as though I’ve just arrived at a Costa Rican version of Fantasy Island. As I climb out, a young man who knows me by name quietly approaches to begin my tour of the stunning property. 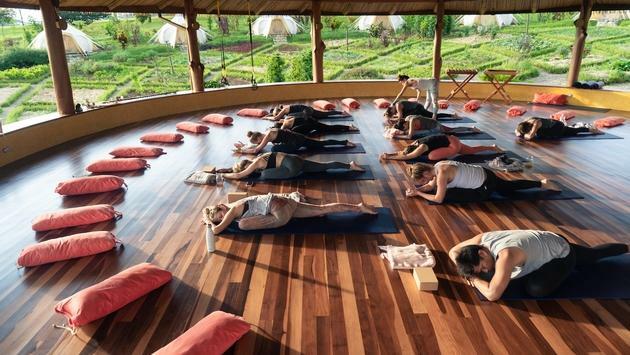 Kinkara is an eco-luxe glamping escape that immerses guests in nature and serves as a setting for yoga and mindfulness retreats, family gatherings and corporate team events. It represents the first stage of David Comfort’s sweeping vision. A one-time hedge fund trader who worked on the floor of the stock exchange and later became a real estate developer, Comfort eventually began seeking fulfillment in other ways and set his sights on creating something that was a service to others. Kinkara is that creation, a place the Encinitas, California resident hopes will ultimately become a thriving community offering residences, a resort, a birthing center and more. But more importantly, Kinkara is a venue for the soul, a retreat that encourages connecting with water, the Earth, wind, fire, and quintessence. An act of service brought Comfort to where Kinkara now stands and when he laid eyes on the property, he knew he’d found the right place to begin laying the groundwork for his plan. 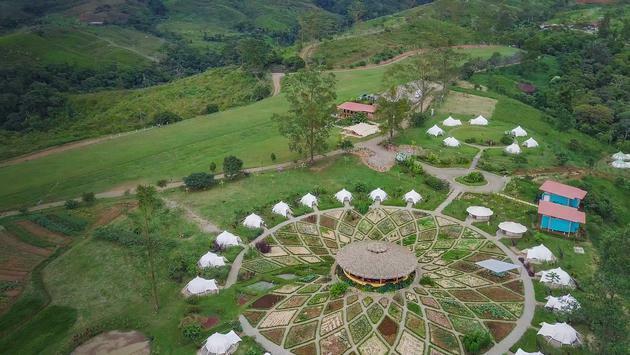 The first phase of this effort, the recently completed glamping camp built around a massive organic garden, was created to establish a space for inquiry, healing, and connection, serving guests on their journey toward a more balanced way of life. There are 35 fully furnished luxury canvas tents set around and amid the property’s remarkable garden, a fascinating ecosystem filled with a wealth of edible fruits and vegetables, ponds and more. "What I'm doing now couldn't be further from the person I identified with for a very long time," Comfort continues. "The fact that we grow our food and designed a place that harmonizes with nature, all of these things are so far removed from who I once was." I’m immediately charmed by the tents at Kinkara, which my guide ushers me to from the plane. The interiors are furnished with simple, locally made furniture, organic 500-thread count linens, hypoallergenic pillows and LED lights. There are also plush robes in each tent and jute carpeting. The beauty of these tiny pods is that they allow you to fall asleep under a canopy of stars and in the morning, the rising sun gradually illuminates your peaceful capsule. El Moren, Kinkara’s sacred space at the center of the property. Each tent faces El Moren, Kinkara’s sacred space at the center of the property, an open-air pavilion created for meditation gatherings, music, yoga or healing work. Many of our days began and ended here, practicing yoga just after dawn and participating in soul-cleansing, almost meditative gong ceremonies long into the evening. Additional social spaces at Kinkara include Casa Bulu, a relaxed, clubhouse offering dining for smaller groups and social time. 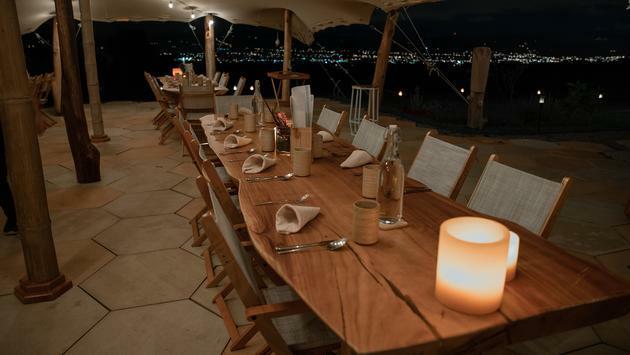 Alongside Casa Bulu there’s a large covered eco-sheik dining tent (think: Out of Africa crossed with Los Angeles trendy) where group meals are served. The grass landing field near where our plane arrived is known as the Aerodrome and is used for activities such as team building, ultimate frisbee, kite flying and more. And not to be overlooked, the property’s spa bath house. The rain showers alone are worth the trip to Kinkara. The top of the shower stalls facing the exterior of the building are wide open. No window, no enclosure of any sort. Just a stunning open space allowing you to gaze out at the palm trees and vegetation-covered hillside while lathering up. Days at Kinkara can unfold in a variety of magical ways. But let’s start with the sprawling organic garden. Kinkara’s Mandala Garden provides guests with farm–to–table culinary delights unlike any other. Meals are created and dreamed up by the property’s award-winning chef, who strives to create dishes that celebrate the abundance of the land while also displaying artistry and diversity with every bite. All of which comes later, at mealtime. First, there’s the garden itself. Planted in the shape of a mandala (as the name implies), and made up of 250 trees and about 400 types of plants, the garden is filled with an enviable variation of greens, more types of kale then I knew existed, medicinal plants, sorghum and all manner of herbs ranging from Costa Rica native basil to Thai basil and holy basil. There’s also a collection of aquatic plants and a pond that’s home to Tilapia. Further beyond the garden, there's a bee sanctuary. “This is the heart of what we’re doing at Kinkara, we are gardening,” says our guide, Itai Hauben, a well-known permaculture teacher who spent three years thoughtfully designing this space. Itai, who bounds around the garden with glee, like a kid on Christmas morning, takes particular joy and pride in introducing us to the remarkable winged bean. The beans, he explains, have 48 percent protein, which is more than twice the amount of protein in soybeans and there are 22 to 24 beans in each and every wing bean pod. This is what a walk through Kinkara’s garden is really all about. It exposes you to remarkable plants you never knew existed, to new ways of gardening and even living, not to mention making you daydream about having the space (and time) to grow a similar garden of your own. Or perhaps a slightly smaller version, but one equally ambitious. 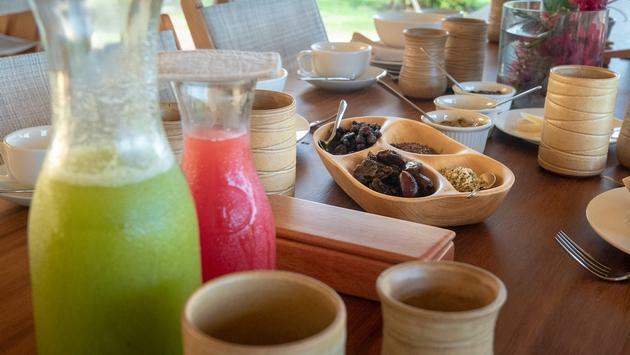 Beyond roaming the garden, activities at Kinkara include cacao ceremonies, gong ceremonies, culinary and kombucha brewing classes; sunrise and sunset yoga and meditation classes. There’s also waterfall and creek swimming on-site. The diverse menu of guided off-site activities available upon request includes ATV excursions, surf lessons, zip line adventures, and eco-tours. Still more options include horseback riding and mountain climbing. Among the highlights of my trip was a visit to majestic Nauyaca Waterfall, one of the main attractions on southern Costa Rica and a waterfall so stunning it's been featured on the cover of National Geographic. Nauyaca is located in a canyon that's more than 250 feet wide and one of the falls soars nearly 150 feet, while the other cascades down a series of steps from about 65-feet. Every single meal at Kinkara also tops my list of unforgettable highlights as well. Pardon the gushing, but if I could eat the way I did at Kinkara, every single day, I’d feel like a superhero before long. Meals include a variety of hand-picked herbal teas, fresh-pressed juices, and the property’s very own house-brewed Kombucha. There were so many tempting, healthy drink options at each meal that I regularly ordered three or four drinks, just to sample as much goodness as possible. The food meanwhile revolves around the natural rhythms of the farm, as well as guests’ preferences and dietary restrictions. The elegant multi-course meals feature earth-to-plate, expertly crafted cuisine showcasing foods that are not only delicious but healing. There are so many things about Kinkara I won’t soon forget. 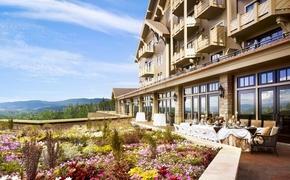 The garden, the food, the mountain top setting. It’s a place that offers unique experiences and learning. It is a location where you naturally rise earlier amid the sounds of the birds outside your tent and go to bed earlier after a day rich with activity, drifting off to sleep beneath the stars. 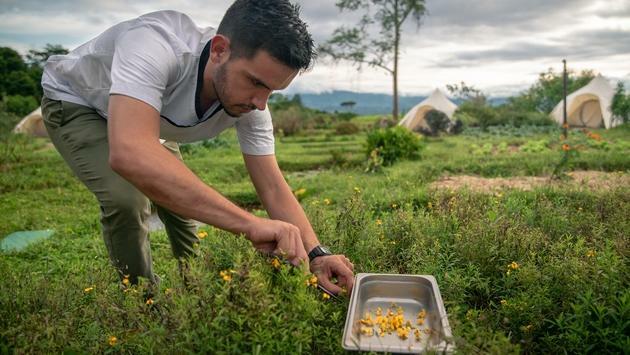 Comfort ultimately plans to relocate his wife and family to Kinkara, leaving behind Southern California life for an existence that's far more connected to the Earth and the rhythms of nature on this plateau in Costa Rica. He says Kinara is not about isolating from the world, but rather moving through the human experience in a much more magical place.